Medium tank – 480 conversions. The young state of Israel was surrounded by Arab nations that were poised to destroy it since the 1930s when the first exodus started. By an order from Defense Minister David Ben-Gurion on 26 May 1948, the Israeli defense forces were created, immediately embroiled in the 1948 War of Independence. The main supplier of weapons was then Czechoslovakia, and there were only improvised armoured cars, ex-British or captured Arab legion vehicles in service and a few jeeps in the inventory. 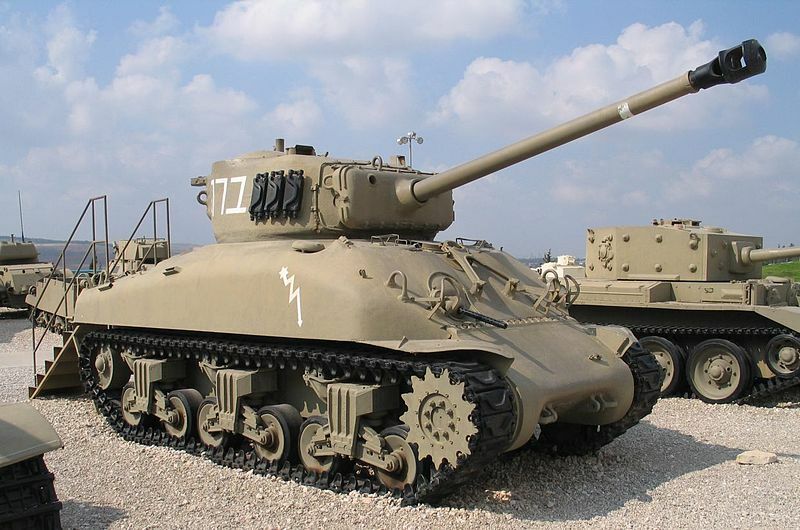 After the war, the need for tanks was obvious and thanks to contacts in the USA, US army stocks M4 Shermans were delivered to Israel in 1950. Six former 105 mm M4 Shermans of the early type have been already salvaged from a scrapyard, left from the ww2 north African campaign. Since they were unarmed, they were rearmed by Krupp 75 mm field guns due to the shortage of 105 mm M4 howitzers ammunitions and demilitarization in Italy. 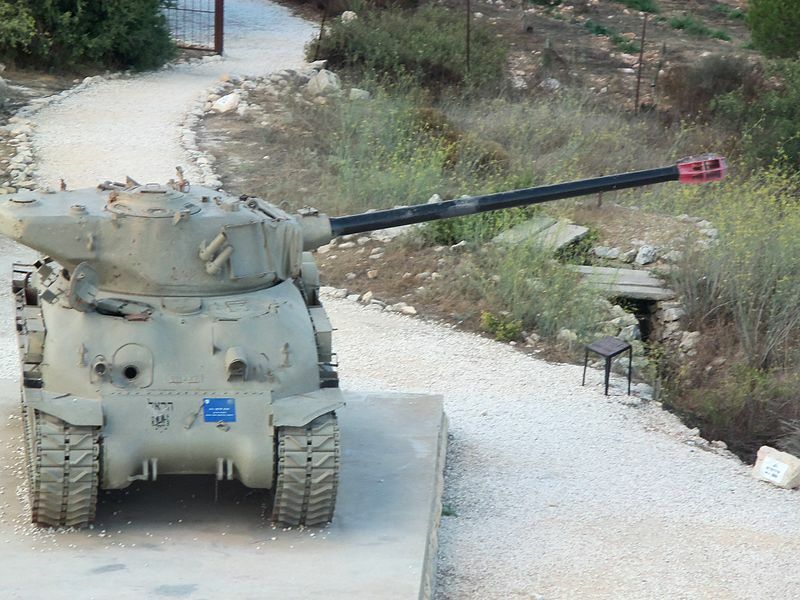 When other tanks of the 1944 76 mm M1 gun type arrived in better conditions, they were all designated Sherman M-1 in Israeli service. 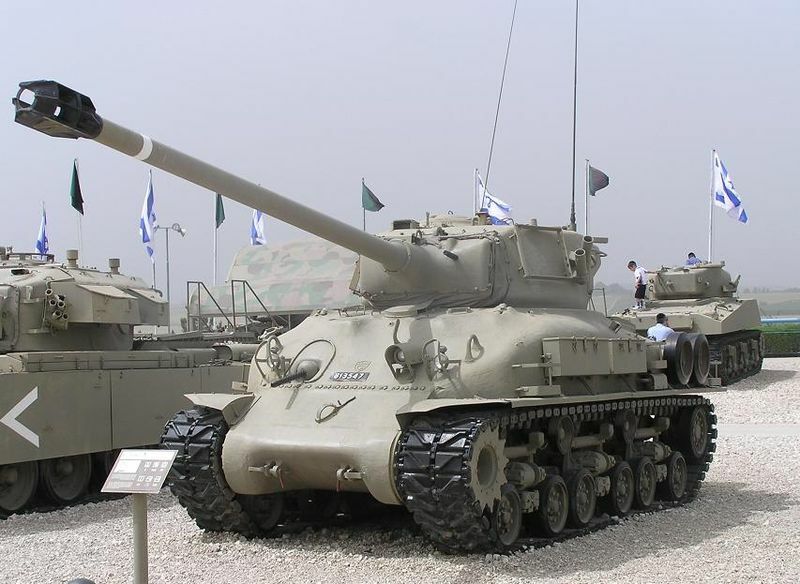 The Super Sherman M-1 was the designation for the M4A1(76) fitted with HVSS suspension, while Sherman M-3s (Sherman degem Alef prior to 1956) was the IDF designation for the 75 mm gun M3. 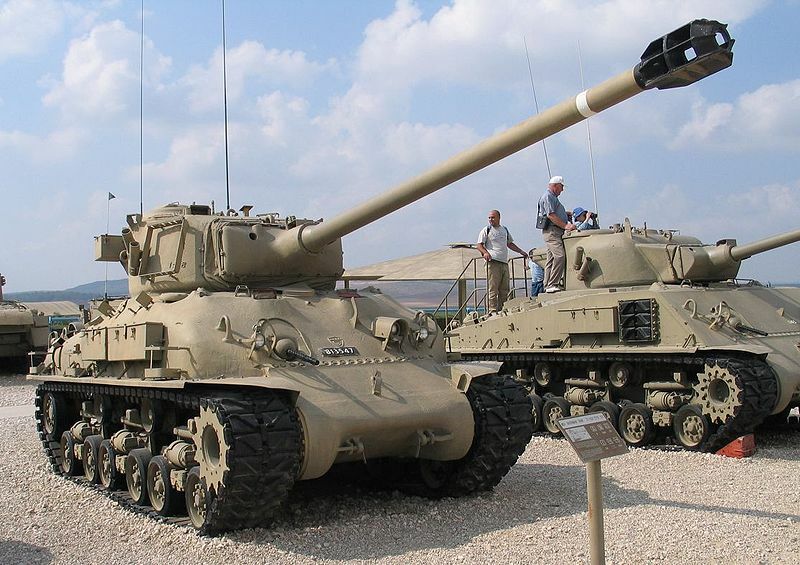 The Sherman M-4 (Sherman degem Bet prior to 1956) was the designation for the 105 mm howitzer M4 model. There were also many variants, but the detail would be too long to expose there. These were the M-50 155 mm, Ro’em, L-39, and Makmat 160 mm SPGs, and the MAR-240, Episkopi (MAR-290) Kilshon rocket-launcher tanks, and other variants like the Sherman Morag (Crab), Trail Blazer (Gordon) ARV, the Sherman Medical Evacuation Tank or “Ambutank” or the Eyal Observation Post Vehicle. All these vehicles served in the Egyptian War of Attrition (1968–70) and the Yom Kippur War. The origin of the program started in 1953 when an Israeli delegation visited France to examine the promising AMX-13 light tank. Although they were not convinced by the thin armor of the vehicle, the gun attracted their interest. Eventually, the Israeli government decided to purchase no less than 400 of these and to devise a mobility-based tactical use alongside the Shermans in service. These tanks would serve extensively during the Sinai campaign. The AMX-13 gun being the high-velocity 75 mm gun CN 75-50 (a development of the German 7.5 cm KwK 42 L/70 of the Panther tank), it was decided to rearm a large portion of the Shermans in the inventory with this piece of ordnance. An order was placed in France in 1955 and an experimental marriage of a M4A1(76) turret with the new gun was shipped in Israel to be tested. 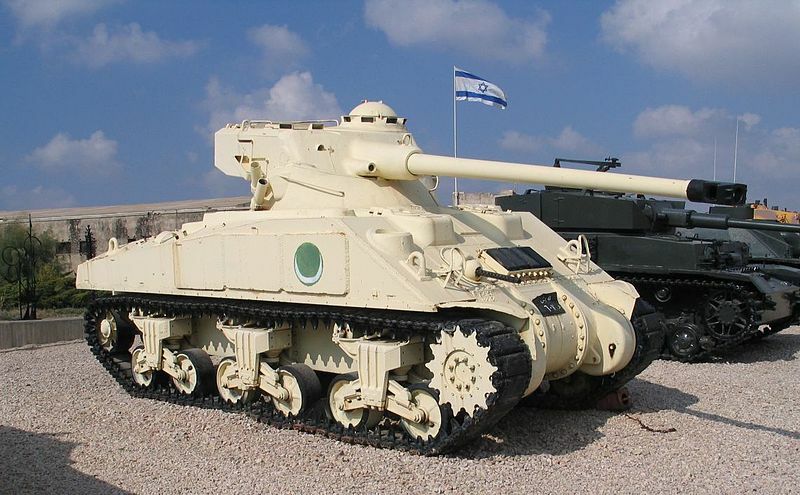 The next year, in March 1956, the Israeli Ordnance Corps began conversions in new facilities with the large supplies of the French gun purchased in the meantime. 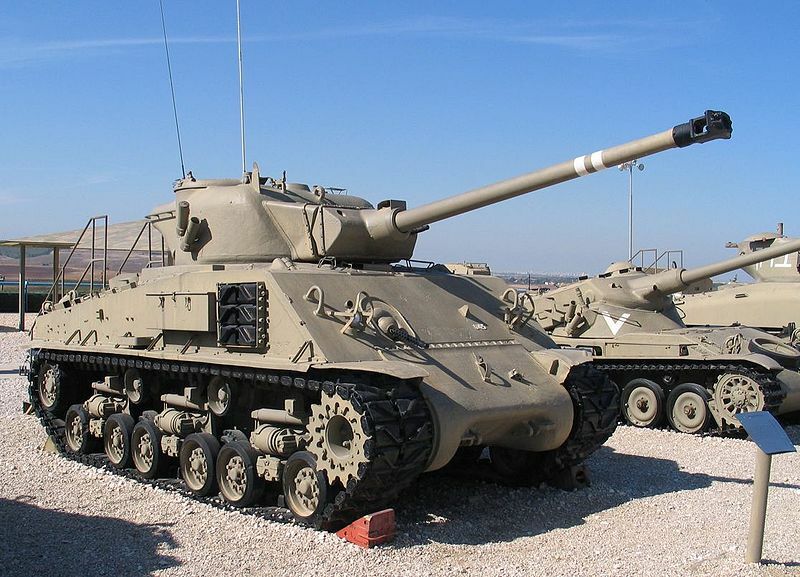 The result of this conversion was named officially Sherman M-50, although it was also known outside Israel as the “Super Sherman”. This marriage looked like the ww2 British Firefly in essence and had similar performances. The old 1944 M4(75) turret was kept but a large counterweight was added to the rear of the basket. A first batch of 50 conversions on M4A4(76)s was delivered all with VVSS suspensions and Continental R-975 gasoline engines. But these were not especially successful. The weight of the gun added some stress on the engine, resulting in breakdowns, as well as compromised the stability and reduced mobility. So the next conversions were all performed on Diesel versions (Cummins V-8 460 horsepower) and HVSS suspensions. For this reasons, these conversion batches were known as the M-50 Continental or Mk.I and M-50 Cummins or Mk.II. In total 300 Sherman tanks were so converted into M50 until 1964 along with some conversions of M10 Wolverines tank destroyers. By 1961 the Israeli ordered the new and more powerful French 105 mm gun, a shortened version of the one used on the AMX-30. To fit inside a modified Sherman turret these were modified, the barrel being reduced from 56 calibers to 44 and equipped with a muzzle brake while ammunition was altered to use a smaller cartridge. The conversion, also based on Cummins M4A1s also included a modified M4(76) turret. By 1965 the new tank named officially M-51 Sherman was revealed to the public in an Independence Day ceremony in 1965. “Super Sherman” and “Isherman” (or Israeli Sherman) were also coined and are frequently seen, but never has been official. 180 Sherman tanks were so converted. By this time M-50/51 constituted the bulk of the Israeli tank force, prior to obtaining the British Centurion. Non converted Sherman were used for other duties (see above). The first test came in Operation Kadesh in the Sinai against the Egyptian Army, part of the Suez crisis in 1956, for the first batch (M-50 Mk.I). Strangely enough, they were confronted with Egyptian M4A4s rearmed with FL-10 AMX-13 turrets. In 1964, the Major Israel Tal was made famous by using a M-50 (his personal tank) and a Centurion with tankers trained for long range shootings, and destroyed a Syrian recoilless rifle and later eight Syrian tractors at 2000m during the border dispute born from the diversion of water from the Sea of Galilee to the Negev Desert. But the main test in large scale came with the Six-Day War in 1967. Virtually all M-50 and M-51 were thrown in action in Golan Heights and the West Bank and the Sinai peninsula, confronted with soviet WW2 era T-34/85s (Battle of Abu-Ageila) and SU-100 tanks. However, in 1973, these tanks were again committed in large numbers, despite their obsolescence and due to the desperate nature of the struggle. Losses were heavier since their opponents were better armed. however, it was shown that the 105 mm armed M51s were able to score kills on the T-54/55 and T-62s using HEAT ammunition. The M-50s of the first batch never participated in this war, being removed from service the previous year. The M-50 Mk.II were gradually phased out after the war in the late 1970s, and the early 1980s for the M-51. During the Lebanese civil war, 75 M-50s were given and distributed among the four Israeli-supported Christian militias in 1976. Some were captured and re-used by the PLO. Another batch was sold to Chile, rearmed with 60 mm HVMS guns. Argentina also rearmed some of their Sherman tanks with 105 mm guns form their own AMX-13s. M-50 Sherman Mark.I (Continental) in action during the Suez crisis in 1956. Command M-50 Sherman Mark II (M4A4 Cummins/HVSS) during the war of 1967, Golan heights, Syria. Unit unknown. M-51 Sherman at the Golan heights, 1967 war. All M-50s used the 75mm M3 armed turret, M4 (75), not the 76mm armed turret. Also, your top speed figures are way off, I’ve seen figures of everywhere from 40km/h to 45km/h, which given the modifications to produce the M-51 added 7 tons to the vehicle, it’s most likely only 40km/h for the M-51, and 45km/h for the M-50. Also, the Shermans with the Krupp 75mm field howitzers started out as M4 (105) armed Shermans acquired from Italy, and were then rearmed with the Krupp 75mm Model 1911 cannons due to both a shortage of 105mm M4 ammunition as well as the demilitarization of the cannons that had taken place back in Italy. For the speed, this line was left from another article used as template and not re-checked. As you noted it’s indeed way off limits ! Thanks for the other details the article was updated. Just for clarification, the Chilean M50 were rearmed with the 60mm HVSM on the original turret for 75mm gun. The M51 retained the French FL-11. All had HVSS type suspension, and apart from the gun change on the M50, they recieved only minor modifications through out their service life, basically to the electrical system. The 60mm HVMS gun had a three-shot, semi-automatic loader on the M50, which could fire all three rounds in three seconds. This semi-automatic loader was absent on the Chilean M-24 which sported the same gun, due to space limitations in the M-24’s tiny turret. They were well cared for, but their age, operational tempo in the IDF, and lack of spare parts made them unreliable; breakdowns were common and the Leopard 1 was a very welcome replacement. Are you from Chile? I have been looking for more photos of the 60mm version as well as confirmation of the autoloader. Hello. I have been modeling since 1968. I have mostly done US and German WW2 armor but I am starting to build Israeli armor. I looked for a spot where a person could try to become a member but couldn’t find one. Do you or are you adding new members. The site so far seems great. Thanks for your time. Dexter Blackburn US Army retired. DAV. Done, in fact the page description stated since the origin: improperly called “Super Sherman”. On the other hand people apparently are typing more for “super sherman” than “M51 Sherman”, we’ll see the mods will bring. I have seen a few references to M-51 versus M-51HV. I thought all M-51s had the 105mm, so what is the M-51HV? Why the M50 & M51 has a weaker armor , i thought it was 90mm , and why did they reduce the armor protection and increase the armament damage? The value we have provided is the raw thickness of the armour, not taking into account the angle of slope. Most M4 tanks had between 50-70mm raw frontal of armour depending on the model, but the sloping increased the effective thickness to 90mm+. The Israeli Shermans did not have any increases or decreases to their armour that we are aware of. Mick, why not add all your suggestions to our Public Suggestion list? To make a suggestion, find the proper era, find the nation, and use Ctrl-M to add comments with the Name, Class, a Photo and links to sources! It would be of great help to us and we actually use the list to decide future releases. I’m an economist being 67 old and I build tanks 1/35 ever since the eighties. i decided for a project that is building IDF tanks, but concerning colors I do not understand if Sinai Grey is the colors shown here. Speaking frankly I’m in a labyrinth concerning colors. How can I solve the problems? A very great handshake for all of you who are reading this. The designation “M-1” was for all Sherman Variants with a 76mm Gun, not only the M4A1E8. 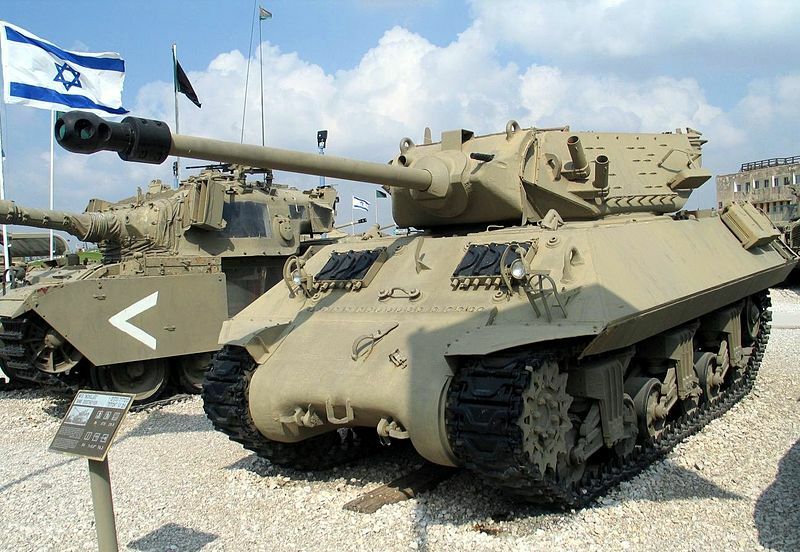 The Israelis had all Versions of Shermans with 76mm Guns. Não sei se o meu anterior input foi considerado mas aqui vai. Entrei num projecto que é construir todos os MBT da IDF mas, agora deparou-sem e um problema enorme. Não sei como fazer o M50 Super Sherman. Tenho o M51 da tamyia e está OK, mas o M50 sei que o da Cyber Hobby e da Dragon são uma dor de cabeça como li no Fine Scale Modeler. Além disso necessito de lagartas (tracks) de borrracha flexivel como as da Tamyia e não encontro nada. Nem fabricante nem lagartas. Como faço ? I do not know if my previous input was considered but here it goes. I entered into a project which is to build all MBT from IDF but, now came across it and a huge problem. I do not know how to make the M50 Super Sherman. I have the tamia M51 and it’s OK, but the M50 I know Cyber ​​Hobby and Dragon are a headache like I read in Fine Scale Modeler. Besides, I need flexible rubber tracks like Tamyia’s and I can not find anything. Neither manufacturer nor caterpillars. How do I do ? Unfortunately, we have little knowledge or experience with model kits. you didn’t mention French sherman that armed with AMX30 105mm gun? The only difference between the Israeli vehicles and the original French Vehicle was that the Israelis used M4s with HVSS suspension and upgraded the engines to a Cummins diesel, so mentioning the french vehicle doesn’t add much. This article does look like it could do with an update thought, so we’ll think about adding it in. Yes it is. It will get both a mention (and possibly its own article) when we overhaul this article. I own a M-50 “Super” Sherman here in Las Vegas with a live main gun. It’s registered Destructive Device with the BATF so everything is 100% legal. I am looking for pictures of the cases, projectiles and cartridges and haven’t had much luck. We need to make our own cartridges like we do for our M60A1 and the M1 57mm anti-tank gun but those cases are easy to find because they were used by the US military forces. We are not having that much luck with the 75mm main gun out of the M-50.